* This post originally appear on the Practicum: Critical Theory, Religion, and Pedagogy blog. 1. What is the main argument of your book? My main argument is the term “Abrahamic religions” is an invented term. Like all of our terms and categories in the academic study of religion it does not name some thing in reality, but represents a sort of wish fulfillment. If Jews and Muslims and Christians—the so-called “Abrahamic religions”—can be shown to possess the same essence, spirit, ethos, or whatever else we may want to call it, then it is often safely assumed that we have found a common core that exists beyond the most recent depressing headlines, and, of course, beyond history. Since the events of 9/11, the subsequent “war on terror,” and the pushback against it, we have seen many embrace and use “Abrahamic religions” as a way out of the current political quagmire. But, and this is the key point, there is absolutely no historical precedent for this term—Jews, Muslims, and Christians have being killing one another for centuries over the proper understanding of Abraham, among other things. What they most decidedly have not done is hugged one another based on this figure, nor have they sat down at what we today dub as “Abrahamic salons” to talk about perceived common beliefs. If local religious communities want an invented term to feel good about one another and enter into interfaith dialogue with other religions, so be it. I have no problem with this. I certainly prefer peace to bellicosity. My problem, however, begins when such an invented term crosses over into the Academy. Initially I saw the term sneak into textbooks, and now it has become a full-blown rubric (like equally fictive ones such as “Judeo-Christian,” “Eastern religions,” or “Western religions”). To my sheer amazement we now see courses devoted to “Abrahamic religions.” There are endowed chairs at major universities for “Abrahamic religions.” There are conferences on the topic. The questions informing my book, then, were pretty simple: How did this happen? Why did this happen? And, when did this happen? Abrahamic Religions traces the genealogy of this term. How it moved from a symbol of exclusion—for example in the New Testament, Abraham is a “pre-Christian” Christian, and in the Quran he becomes a “pre-Muslim” Muslim; and in neither tradition is Abraham a symbol of interfaith relations—to one of inclusion. So, in many ways, I see the book as a case study that exemplifies the much larger discipline of religious studies and its problematic use of terms. If “Abrahamic religions” is so problematic for the reasons that I have just outlined, then even much more basic terms—“Judaism” and “Islam,” to name but two examples—also become complicit in, for lack of a better term, “the disciplinary lie.” To this end, the final chapter makes the point that if we really want to be specific and accurate we can neither speak of “Abrahamic religions” nor Jewish, Christian, and Muslim relations in, say, the Middle Ages. What we can speak about, though, are specific interactions between various social groups often with very porous boundaries who exist locally, say, Jews and Muslims in Cordoba in 1203. This is why I subtitled the book On the Uses and Abuses of History. 2. What motivated your work? That’s pretty easy. Lying in the service of ecumenical ends. Are we really willing to lie to make our students, our colleagues, and ultimately ourselves, feel better about the world we live in? I see the goal of scholarship to be critical of everything that has been bequeathed to us—terms, categories, basic narratives, axioms, and so on. Unless we do this, we just take things on authority. If we assume, for example, that “Abrahamic religions” is a natural category that actually names something real, then we haven’t really clarified anything. It is one more barrier that we have erected that limits our understanding. 3. What theory or theorists inform your methodology? I wear a lot of hats, and do not believe in methodological purity. 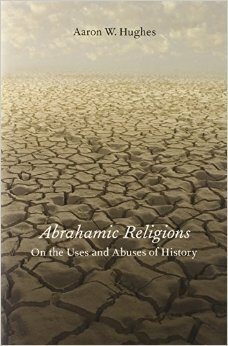 In terms of religious studies, I am informed by the usual suspects—Jacob Neusner, J. Z. Smith, Bruce Lincoln, Donald Lopez, and Russell McCutcheon. In terms of philosophy, I would have to say the line running from Nietzsche to Derrida via Heidegger and Foucault has been very important to my intellectual development. In this latter context, I would also have to note my indebtedness to Elliot Wolfson, a philosopher and friend, whose creative work and conversation have always helped me to see what is important and, especially in the context of Judaism, to grasp how pernicious an attachment to perceived atavistic essences can be. Another important area for me, at least in this book, is history. Here I am not so much interested in historiographical theory than I am in the close and often hesitant readings that historians bring to their material. They are often unwilling, unlike so many scholars of religion, to make sweeping generalizations in the service of some all-encompassing myth or lie. While History may not be as theoretical as I like (trust me, I spent three frustrated years in a History department), it is, as I like to tell my students, one of the best antidotes that we possess for the essentialist and other excesses that seem endemic to the current practices found within the academic study of religion. 4. How might the book be used or how has it been used in a classroom? I think it has already been used in several classrooms, from what I can tell. I think it could be used in a theory and/or method class, again, as a case study of the problems besetting the academic study of religion. I would also think that selections of the book could be used in an introductory class that is meant to introduce students to the three “Western religions.” In such a class, I would hope that my argument might nicely problematize for them the danger of using such unwieldy terms. 5. How do you think students would most benefit from your book? Again, I think the real benefit of the book for students would be as a caution to using terms that are problematic, but are assumed to be natural or, at the very least, neutral. In this regard, I think the book charts, in non-jargony language, how we got from there to here. It starts with a problem and then goes back to the historical record to see the various turns that the term has undergone until finally, post-9/11, many can declare that there is now such a thing as “Abrahamic religions.” The book shows quite clearly when, why, how, and by whom this term was invented. If students can see this for “Abrahamic religion,” I would like to think that they will start to question pretty much every other term in the conceptual toolbox of religious studies—myth, ritual, liturgy, Eastern religions, Western religions, Hinduism, Buddhism, Islam, to name one a few big terms. The real problem with the discipline, though, is that we rarely do this—in the classroom, at the American Academy of Religion, in our academic writing. In sum, then, I would like to see this book as a call for conceptual and terminological clarity, and intellectual integrity. This entry was posted in Uncategorized and tagged Aaron Hughes, Abrahamic religions, American Academy of Religion, and Pedagogy, Bruce Lincoln, Donald Lopez, Elliot Wolfson, J.Z. Smith, Jacob Neusner, Practicum: Critical Theory, Religion, Russell McCutcheon, war on terror. Bookmark the permalink.